Slow brew is the best brew. Brewing slowly is the best way to brew. We know this long before the final product meets the cup, before you take that first cautious sip. It comes down to science—the surface area of the ground beans and the slow pour of water over them. 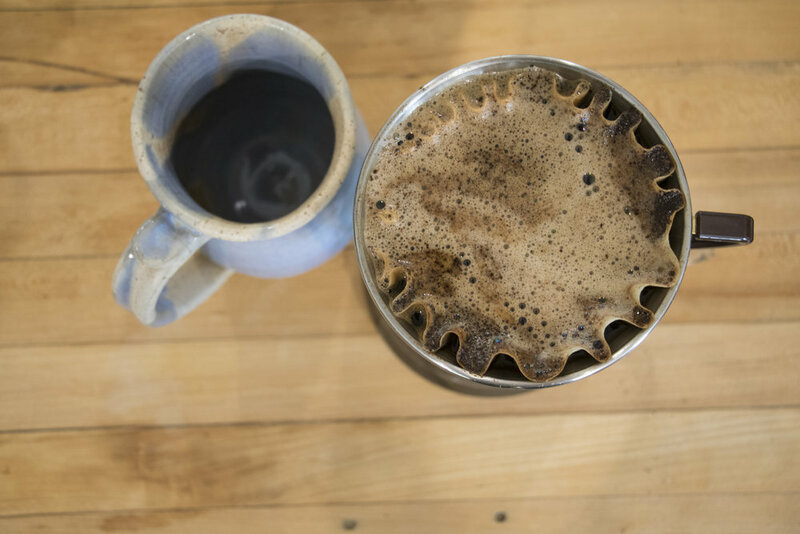 Brewing pour-over coffee takes a creative approach and the patience to try new things. The initial “bloom” is a light pour just to wet the beans and start them releasing gases as the boiled water makes contact. This can be likened to an anointing, as compared with the process inside your average Mr. Coffee auto-pot, which is more like an unceremonious deluge that scalds or drowns the beans before they have a chance to de-gas. This button-operated process is like a traumatic swimming lesson for your ground coffee. Like humans, coffee needs to breathe before being completely submerged in water. The next few pours are slow but heavier than the first, each one allowing water to cover the entire surface area of beans and ultimately, extract the most flavor for the final cup. This slower, gentler process of pour-over unlocks the tasting notes in different coffees, from the nutty sweetness of a lightly roasted Mexican variety to the peppery, vegetal qualities of a classic Sumatran. Dump a pot of hot water over some beans you ground yesterday, and you’ll likely miss what makes a coffee special. An ideal pour-over coffee takes a few minutes to brew, between the first bloom and final pour. You have to watch, pour, and wait for the coffee to react in its own way. Some take longer to bloom than others, and your job as the brewer is to pay close attention and respond accordingly. Brewing this way takes patience, experimentation and creativity—and the finished product is best enjoyed right away. Taking our time is not something we’re accustomed to anymore, with the advent of smartphones, synchronized calendars, and those self-checkout kiosks at your average quick-serve restaurant. There is something meditative about enjoying the process, especially when that process makes the final product a better one. Respect the time it takes to make something great and you might just want to change your pace for good.